If you’re looking for a portable audio system for your iPod Nano then the 1-inch thick (or thin depending on how you look at it) MicroBlast from XtremeMac may be the system you’re looking for. The unit itself is very small so it is perfect for transporting. In fact that’s really what this system was designed for. 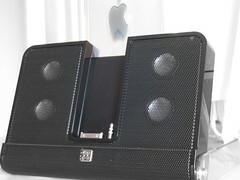 The plastic clear case bends backwards and converts in to a stand for the speakers. Folding them forwards again will transform it in to a cover. You can power it from Mains or use six AA batteries. 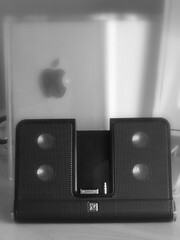 You don’t have to worry about weight either as these speakers weigh next to nothing even with the batteries in! With most XtremeMac products that we’ve encountered at the TechCast Network, we always expect high quality. The speaker grille is made of aluminium and the outside edging as well as the middle portion is interchangeable with a white frame. 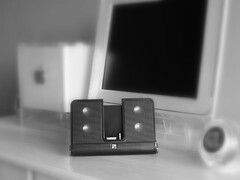 So it doesn’t matter which colour Nano you’ve got, you can customise these speakers to match it! To change it, all you have to do is remove the two screws which hold the cover for it and it just slips out. Pop the new one in and re-attach the screws and you’re done. It’s a 10 minute job and a perfect solution from XtremeMac rather than providing two SKUs like many other speaker manufacturers do. The main speaker grille remains black but with either frame, it remains stylish. Your iPod Nano can also travel in this unit and remain protected providing you’ve got the cover folded forwards. Although it’s a tiny element to this unit, it’s a genius idea and makes it just that bit better for when you’re on the move. There are four tiny speakers built in to this unit which drives the sound. You’ll find ample volume from these speakers but one thing that was lacking is bass. Not that I was expecting a lot of bass anyway. You can’t really complain about the sound quality, it’s crystal clear, the only thing that lets it down is the bass but with it being a portable system, a compromise has to be made somewhere. Your iPod Nano can charge up using either the batteries or the AC adapter and since XtremeMac have thought about the design, the cord that attaches at the back travels out through the case cover where there is a small archway for the wire to come out. This allows the system to sit comfortably flat on a surface rather than at an uneven angle with it sitting on the wire. In the box you of course get both black and white frames, ours came with the black one attached already, the AC adapter, the speakers and a travel pouch. The travel pouch is another small handy part to this setup. It’s definitely the first portable system that I’ve had the pleasure of reviewing that came with a pouch. XtremeMac have thought about most aspects of this system. I say, thought about most, because there are a few things I’d change about the MicroBlast. I would include a USB docking connector at the back for starters and for the price of $119 I would perhaps expect a bit more for the money. They have done an excellent job on the overall design which features a solid construction using high quality plastics for the main body and an aluminium speaker grille. The travel pouch was a nice inclusion as well as the black and white frames. It’s just missing that one thing and I think it’s the remote control. That would be a nice addition to the package and would have made the system a perfect portable speaker system. Overall sound quality was great for its size with plenty of volume when you need it. If you just want to listen to it quietly again it is able to produce a crystal clear and distortion free sound. The XtremeMac MicroBlast misses out on the TechCast Recommended award mainly down to the price and missing synching capabilities. One tip would be to include that and possibly a basic infra-red remote.